U.S.C.A TITLE 42 IS YOUR REMEDY,WHEN SUING COLORADO DHS caseworker,supervisory managerial et.al; when violated, pro-se. Be sure to learn as much as you're feasibly able to when suing pro-se and good luck to you all. If our founder was able to master such there is no reason,when you're "truly being violated" why you can't. In the state of Colorado,many did not even realize they can sue dhs individual worker(s)for damages associated with such removal and damage to per adult victim of CPS and the child. #LEARN all you can and good luck. Father Rights violation by COLORADO DHS, is pretty much prevalent as case law wholly support,when it pertain to the DHS and such unlawful act(s)to his child, his own rights. Grandparents being overlooked for procurement of custody temporarily is frequent, ergo, do not believe this is only sporatic, it is actually quite ubiquitous everyone. FALSE ALLEGATIONS TO KEEP CHILD UNDER DHS CARE & SUPERVISION,UNTIL ADOPTED HAPPENS OFTEN. WRONGFUL REMOVAL OF A CHILD FROM COLORADO DHS,HAPPENS MORE TIMES THEN IT SHOULD. Mother Parental Rights by COLORADO DHS, is pretty much prevalent. Such caseworkers, as per state, has to abide by such protocol, procedural,policies,everyone. when a lawyer simply do not care about one's injuries,and rights,to sue. A child is removed from the home, yet the caseworker has failed to procure the necessary warrant of removal,and or the required judicial authorization to SEIZE such child. Then later shall conjure up falsehoods,a mile long and or lie to the police detective, insofar as but not limited to a. )keeping child b. )terminate the parents rights, by colorado DHS. A child is removed from a loving home, even though the caseworker has prior told the parent,"no fault of yours,and you have done nothing to require a removal." We are just taking the baby as a "precaution." 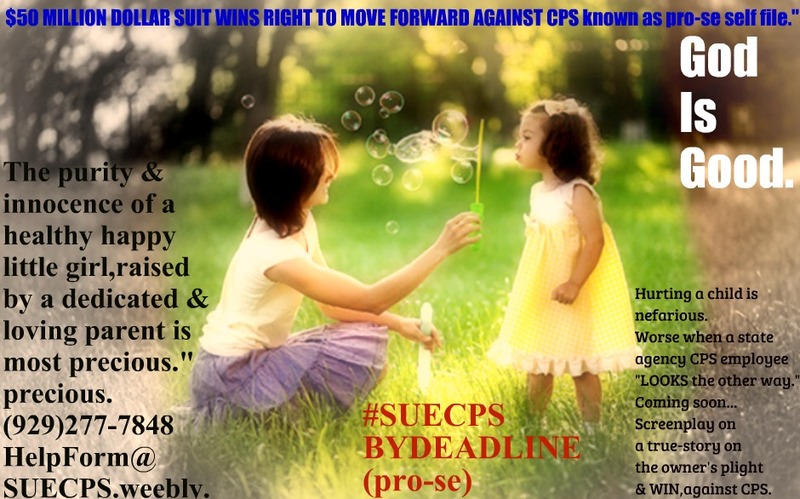 This was reported to our hotline at our effective- student research WON network ctr., by quite a few,yet the victim did NOT realize one can sue such worker for but not limited to violation of one's right, 14th amendment, the intentional, deliberate, conspired act,to deprive a good loving parent of such well-established fundamental right to their own child. • A PARENT is losing a child premise on ZERO imminent danger, to the child and or the child health. Yet most never knew they can sue pro-se self file by deadline colorado dhs. • A PARENT is being at high-level falsely accused,while the child they love is at a higher-risk of imminent danger,when away from the parent,once placed in a foster care home. Be sure to read more below and throughout this informative powerful 1 of a kind site. The founder has "been where you're at,and she fought back with prowess,tenacity,aggressiveness,and KNOWLEDGE."" She sued. Simple as that. ext. 806. She WON. More Good loving parents,are realizing they indeed, can sue CPS,and challenge the DHS caseworker(s)supervisor et.al, involving one's constitutional,fundamental rights,and this is being seen actually nationwide more in the 21st century. liable workers,without a lawyer. SHE KNEW her DEADLINE was arriving. Such lawsuit was filed just in time, and that means before such deadline on her own pro-se self file. She understand the ins and outs of suing cps worker (properly and timely by deadline pro-se)and will continue to share her blue print,per request with others,when you're about to sue cps worker,DHS per violation of your family constitutional right,parental rights,and per child,grandhild, insofar as she understand how hard it is to hire lawyer since most do not care at all about your right being violated, and a court appointed lawyer, can care less or would not allow what has happened to you,the child,grandchild while in state supervision etc.al, YOU are able to learn on your own,as she has mastered,when suing DHS. Just don't miss your deadlin to file. So many sadly has, premise on "waiting around on a lawyer to care." Most have lost right to sue,and or did NOT keep up when filing their suit. to move forward per cause of action/claims timely filed.